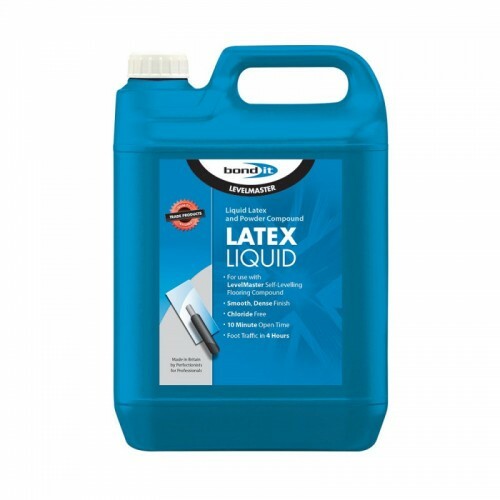 A polymeric, casein-free, liquid latex for use with LevelMaster Standard self-levelling compound. Will improve adhesion, wearing properties and increase flexibility when added to levelling compounds. Should be used to improve “water-mix" levelling compounds especially when used on substrates subject to movement i.e. timber or metal decks. It can also allow levelling compounds to be used as final finish in lightly trafficked areas. Suitable for use on concrete, well braced timber, mastic asphalt and quarry tiles when used with LevelMaster Standard self-levelling compound. The liquid should be placed in a mixing bucket. Slowly add the powder component to the liquid latex, stirring quickly and continually, until a smooth paste develops. Only mix enough to use within 20 minutes. A mechanical stirrer is recommended for mixing. For every 20Kg of Bond It LevelMaster Flooring Compound use 1 full bottle of Bond It LevelMaster Latex Liquid.